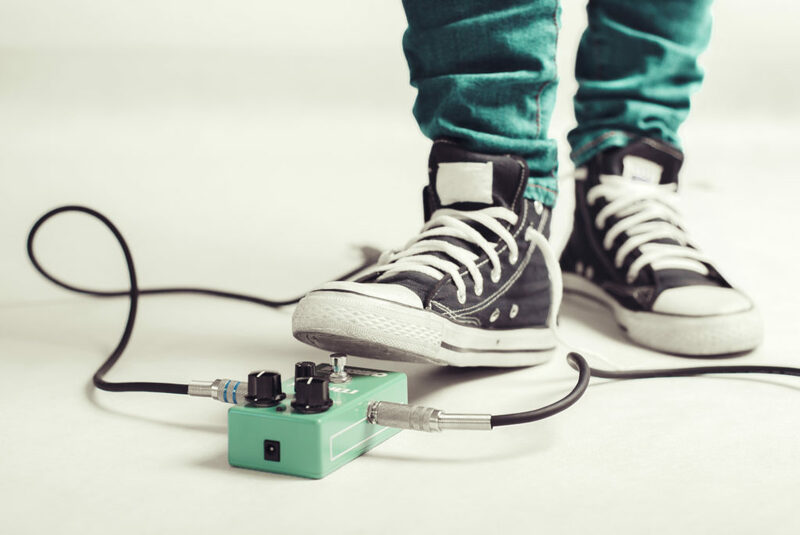 Guitar Delay Pedals - Which Effect is Right for You? 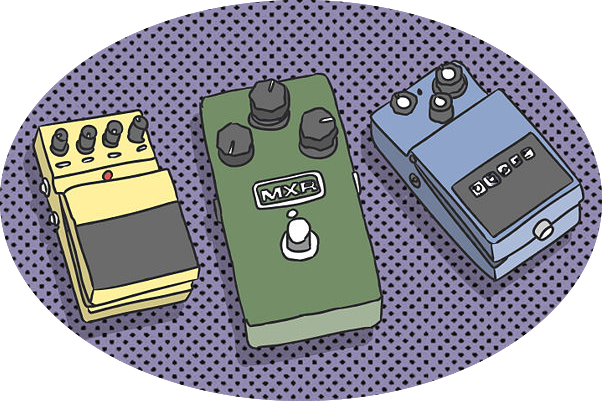 Guitar Delay Pedals: Which Effect is Right for You? From Tape to Digital: Which delay effect is right for you? If you’re putting together an array of effects, chances are you’ve been trying out different delay pedals. Delay pedals create that echo effect you’ve heard on countless songs, and are useful in many different ways. From creating extra texture, to giving the illusion of a whole other guitarist, delay can expand your playing and add new dimensions to your sound. But with so many choices, it can be hard to find the right effect. Some players swear by analog delay, while others require the precision of digital. And maybe you’ve even seen those lunchbox sized tape delay units that often come with a huge price tag. As manufacturers offer more and more effects options it can be hard to know what to use. To give a little historical perspective, we start with tape delay which was developed in the early 1950s with the help of a very familiar name: Les Paul. Tape delay is exactly what it sounds like. 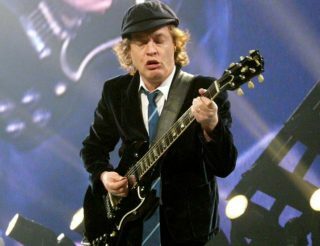 A tape records your guitar signal for a certain period of time and then automatically plays it back creating the echo. Because tape delay units rely on moving parts and a (often difficult to find) tape cartridge, this is not the most efficient type of delay effect. Generally these are used in studios to achieve a more “vintage” tone. 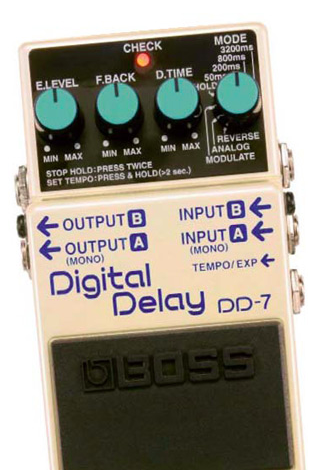 The two most common types of delay these days are analog and digital. Both are typically built as compact stompboxes, but there are some fundamental differences that set them apart. Analog delay pedals have been popular since the mid 1970s and rely on a microchip that was pioneered by Panasonic. The famed “Bucket Brigade” chip works by feeding the original sound from the guitar back into the signal chain at timed intervals. Since there is nothing in the circuitry of the effect to preserve the fidelity of the echoes, they will degrade with each repeat. The result is a very natural sound that mimics the effect of a real echo, which degrades in sound quality as it reaches your ears. Many players feel that the warm tone produced by analog delay is superior to that of digital delay, but it’s not without its limitations. Because of the simplicity of the circuitry, analog delay generally has a much shorter delay time than digital units, and far less flexibility in terms of creating different delay patterns. Digital delay, on the other hand, takes your guitar’s signal and converts it to zeros and ones, creating a perfect replica of each note. 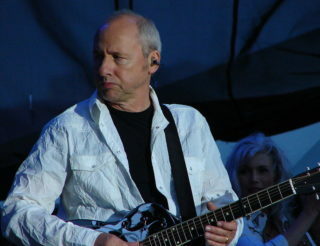 The echoes sound very clean and precise, but without further processing, tend not to have a natural echo tone. That’s not to say that digital is without it’s advantages. If you prefer long delay times, (echoes longer than a couple of seconds) digital is probably the way to go, as it offers delay times sometimes longer than a minute. This can allow you to use delay to create long loops. Another advantage of digital is the ability to create rhythmic patterns with the echo. Some delay units like the TC Electronics Nova Delay allow you to structure your echoes like notes so you can achieve a rhythm to the echo that fits the song you’re playing. A great example of this is the intro to U2’s “Where the Streets Have No Name”. That rhythmic effect would not have been possible with the limitations of analog delay. Digital units also tend to be a bit cheaper, but with the rise in popularity of analog delay, manufacturers are finding ways to produce cheaper analog delay pedals that still sound very impressive. The MXR Carbon Copy, for example, is a great place to start without spending all your rent money. Because of the huge differences in delay pedals, I’ve been fond of keeping one analog and one digital pedal on my board at all times. I’m a fan of the Electro Harmonix Deluxe Memory Man for analog and the TC Electronics Nova Delay for digital. Because they serve such different purposes, I think of them as two entirely separate effects. One gives me a warm, vintage sound, and the other, a clean, precise echo. As with any effect though, there is no “best” product. 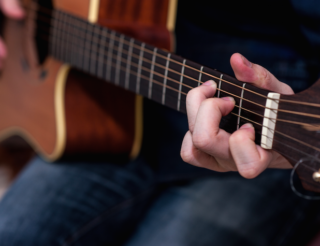 It’s all a matter of what creates your perfect tone. Hopefully, knowing the difference between these types of effects will make to process of finding the perfect one that much easier.